About two years ago we listed our inn for sale. We have innkeeping for a long time (16 years), and with both of our sons in college, the time was right to look for new adventures. At first we listed with a broker; now we are selling the inn ourselves. 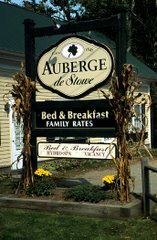 We have shown the inn many times, received a couple of insincere offers, and had one serious offer that didn’t work out. During that process, one theme emerged over and over: the numbers. Like disciplined business school students, potential buyers want to see the numbers—our financials, that is. Profit and loss. Income and expenses. Occupancy. The nitty gritty. And potential buyers should want to see the numbers. It says a lot about potential buyers that they should want to see how we ran our business. Note verb tense choice: ran. Past tense. Also note the use of “we,” as in Shawn and Chantal. Maybe I’m overthinking this, but I think the last thing a potential buyer would want to see is the numbers. My numbers. I think a much better indicator of future performance would be an analysis of the market—both the larger national and economic trends, and the local market, which in this case is Stowe, Vermont. Even though potential buyers are also buying the business, and rightly want to understand what they are getting for the money, my past numbers are not an indicator of their future numbers. After all, I could just be the crappiest innkeeper/businessman on the planet. I am a writer, after all. What good are the numbers then? The thinking here is that a poor financial showing could be used as a negotiating tool. I get that. But to think that past performance by someone whose motives and skills are unknown could scotch a deal is silly. Of course there is the argument that an underperforming business holds potential, and the only way to evaluate that is to look at the numbers. But the price is the price, and essentially a buyer is getting the real estate, the location, and the good will—the customer list, the name, the website, and that’s about it. So underperforming or not, the numbers won’t make much difference in the price. Probably the best indicator of being a successful innkeeper is your own past performance—at business, at relationships, at problem-solving. Have you ever run a business before? Have you ever run a service business before? Have you ever run a business where you share an identity with not only homemade jam, but plugged toilets? That will determine your BF—your burnout factor. We’ve seen people last as little as three years, while others continue to do this past the 20-year mark. The griddle arts can be taught. Demeanor? Not so much. Another good indicator is money—namely, how much money do you bring to this game. Do you have mystery money? Are you a trustifarian? Or will your wealthy in-laws finance this for you? What about a down payment? Potential buyers don’t need to see our numbers to see how many rooms we have, what we charge, and what average occupancy rates are for the industry, or even in this area. In many ways, buying an inn should be what the French call a coup de foudre—literally love at first sight. An emotional decision. Something in your heart that says, “Yes!” Because if your heart is in this, if you are risking emotional capital, that means you are the kind of person who will make a good innkeeper. And being a good innkeeper is the way you become a financially successful innkeeper. If your heart is in the game, people will recognize that, and they will respond with repeat visits, with word of mouth, and with positive feedback in the wonderful world of social media. You have to love yourself, you have to love where you live, and you have to love doing what you do. I struggled with that for the first few years. Then I went to graduate school, got my MFA in Creative Writing, and became a teacher. After that, I enjoyed innkeeping a whole lot more. That’s because innkeeping is about solving problems: where to eat, where to play, what to talk about. It’s not about what the innkeeper wants; it’s about what travelers need. And what travelers need is you. They need to know how you met your spouse. They need to know about your kids. They need to know how you feel about dogs. They want to hear about how you broke your shoulder, the time you had kidney stones, and which chef at which local restaurant just got divorced. In other words, they need stories. And innkeepers have to tell them. Stories make us human, and that is what the traveler is looking for: humanity. They are not really looking for a finely appointed room with your every need anticipated in a luxurious getaway built to suit your need to be wowed. They are looking for you, and they are looking for your stories. So while you shouldn’t forget about the numbers, they aren’t the most important thing about the inn. They are just a little piece of the story.